Islamic Foundation North invites and welcomes all brothers and sisters to its Iʿtikāf program. Seclusion was important to the prophetic mission. The practice of Iʿtikāf is an act of worship in which the servant secludes himself to the masjid seeking closeness to Allāh in the blessed last days of Ramadān. It is an act of temporarily withdrawing from the world and reconnecting with Allah in a meaningful way. In light of this, participants will be encouraged to complete the recitation of the Qur’ān, engage in their own personal supplications and silent dhikr, listen to speeches on certain nights in the last 10 nights of Ramadān, and pray the Qiyāmul-layl. Ramadan is undoubtedly the month of great blessings for us as Muslims. 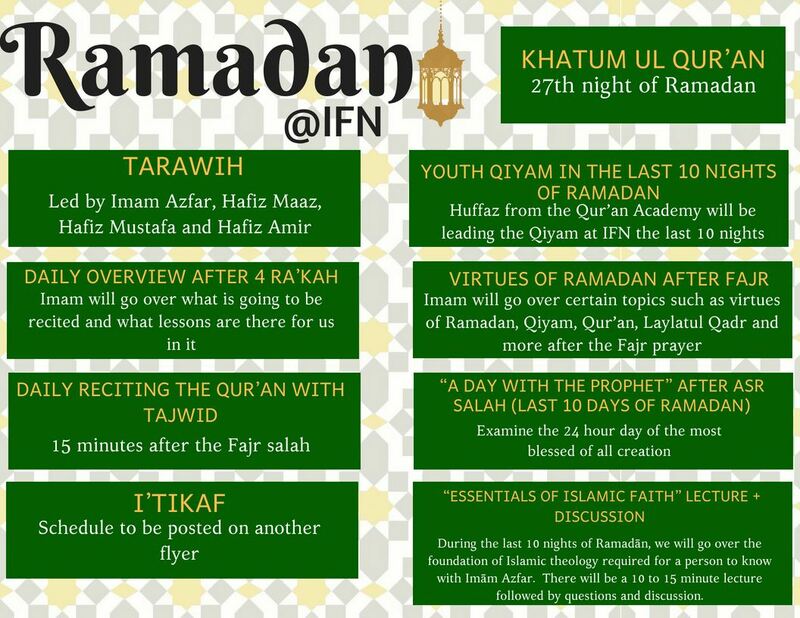 With a chance to reconnect with Allah (SWT) and grow closer to him throughout the month, IFN offers tarawih prayers, itikaf arrangements, daily iftar throughout the month, and sahoor during the last 10 days to encourage members to spend as much time as the masjid as possible. Being that it is also the time of the year in which rewards are increased, volunteers are greatly encouraged to devote some of their time to help facilitate all of these services. Whether it be cleaning, coordinating parking, or simply donating, the help is always appreciated. Please contact an Executive Committee member to find out where you can help. Also, during this month, IFN invites its Muslim and Non-Muslim neighbors of the Lake County Area for and Inter-faith and Intra-Faith Iftar/dinner to be IFN's distinguished guests and allow us to host them and share the Muslim tradition together as a community at large.